Los Angeles, CA � Roland announces the TD-1DMK V-Drums, an entry-level electronic drum set with legendary V-Drums sound and playability. The TD-1DMK offers a variety of great drum sounds, authentic acoustic feel with Roland�s famous dual-ply mesh pads, and access to powerful skill-building tools with onboard coach functions and free Melodics for V-Drums training software for Mac/Windows. This makes it an ideal choice for beginning drummers and practicing students, as well as adults who want to get back into drumming later in life. Delivering a fulfilling drumming experience in a compact kit that can be played quietly with headphones, the TD-1DMK is an infinitely inspiring instrument that will launch a lifetime of drumming satisfaction and enjoyment. 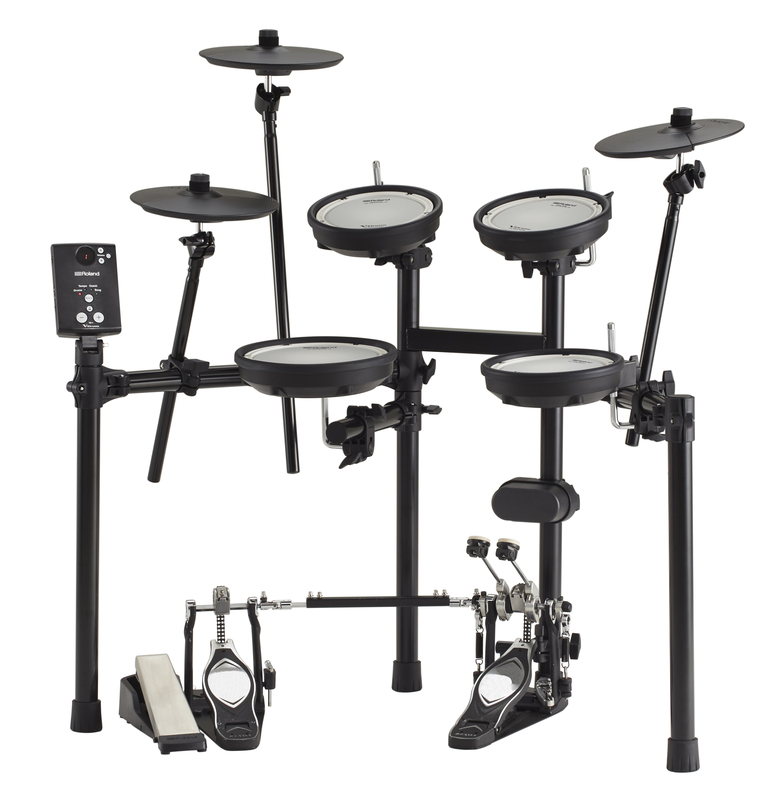 For players who are just starting out, the TD-1DMK is a hassle-free drum kit that�s easy to set up and intuitive to use. With just a few simple steps, users can start playing an authentic-sounding collection of 15 preset kits and enjoy a realistic and engaging drumming experience right away. And with onboard coach functions and Melodics for V-Drums software, they�ll learn essential skills and experience improvement with every practice session. Weighing just 15.5 lb./7 kg, the TD-1DMK is convenient to move around the home and to other performance locations as needed. When a child learns a musical instrument, they build discipline, determination, and many other essential life skills. Accurate timing and keeping a solid beat are fundamental elements of drumming, and the TD-1DMK�s onboard metronome and 10 coach functions motivate successful development with a game-like experience that keeps every playing session fun and engaging. Melodics for V-Drums takes learning even further with interactive drum lessons that build a sense of rhythm without it seeming like hard work. The TD-1DMK�s pads are quieter than other electronic drums too, allowing children to practice for extended periods without limitations. With its great feel and natural response, the TD-1DMK supports developing all the traditional techniques needed to be a top-level drummer. Thanks to the fast processing and authentic acoustic sounds of the kit�s module, the TD-1DMK faithfully responds to the subtle nuances of the user�s playing, with every dynamic nuance detected and faithfully relayed. Compared with other mesh heads, Roland�s dual-ply mesh heads for the snare and toms feature adjustable tension, and also provide authentic natural rebound that�s as close as possible to the feel of playing acoustic drum heads. The TD-1DMK�s kick pad is compatible with standard single and double kick pedals, and features a soft rubber surface that absorbs noise from the beater while maintaining natural acoustic feel and response. The TD-1DMK is the perfect solution for bringing drums back into anyone�s life. From onboard songs across a variety of genres to connecting a smartphone to the module and playing with favorite tracks and web lessons, users can drum along and quickly reignite their musical passion. And with the ability to play quietly with headphones, they can fully immerse themselves without disturbing family members and neighbors. The durable TD-1DMK is infused with renowned V-Drums reliability, providing playing confidence for years to come. As skills and ambitions are renewed, there�s even room for expansion by adding an extra crash cymbal or upgrading the sound module.